This beautiful property enjoys stunning views over the nearby Hipica Riding school and all the way down towards the coastline of Sotogrande. On the ground floor you will find a modern fully equipped kitchen with all latest appliances. There is also a small toilet and open plan living/dining room with a fireplace that leads onto the outdoor terrance and one of the widest gardens in the urbanisation for 2 bedroom Townhouses. The perfect location for outdoor meals and entertaining guests. On the first floor you will find a guest bedroom with ensuite (shower and bath) with pretty views into the urbanisation. The master bedroom is accessed via a large dressing room with fitted cupboards and features a large ensuite bathroom, small terrace and fantastic views. This townhouse has double-glazing, air-conditioning and underfloor heating throughout. There is plenty of built in cupboard space and storage throughout the property. There is beautiful communal pool just a couple of minutes walking distance from the house. Los Cortijos is one of the most prestigious urbanisations in Sotogrande, all properties are within walking distance of the world class La Reserva Golf Course and will benefit from Sotogrande’s massive investment in the area. Ideally located just 5 minutes drive from Sotogrande International School and 7 minutes from Sotogrande Beach/Golf and Tennis Clubs. There is a 24 hour security plus 24hr concierge service. 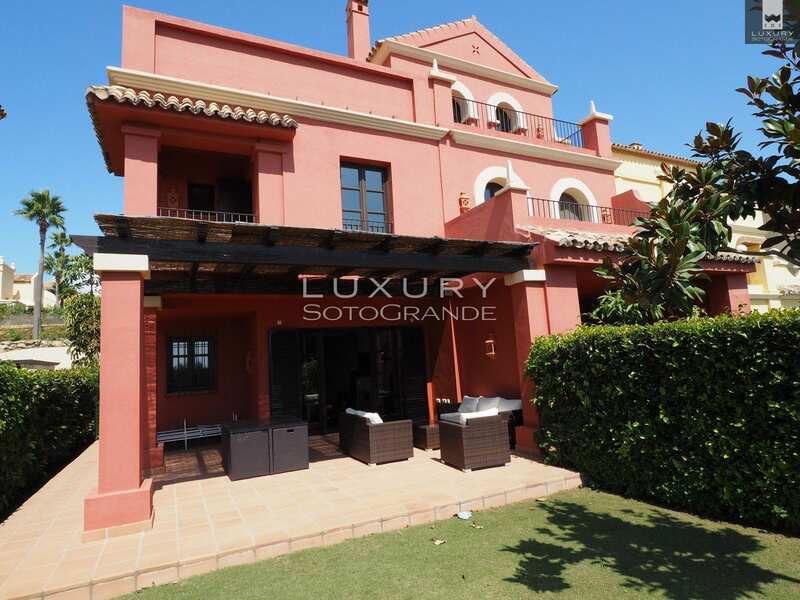 This property is available exclusively through Luxury Sotogrande.